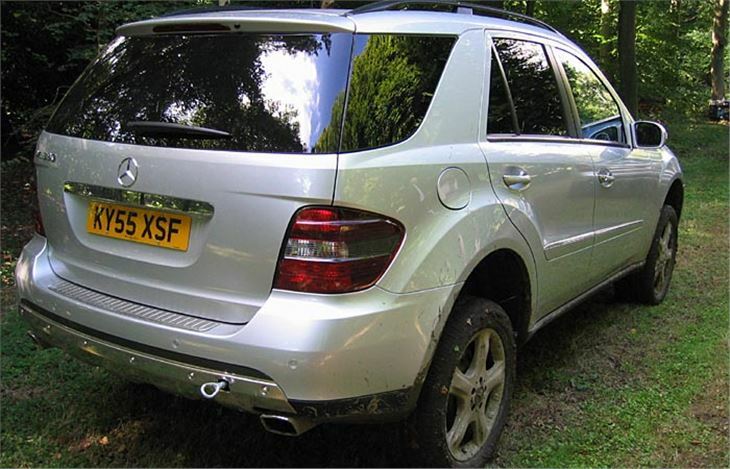 On and off road test of the 2006 Model Yer Mercedes Benz ML. Do you choose the Rioja because you like it, or the Chardonnay because she likes it, or settle in between for the Viura? Do you buy a small house near your work or big house 30 miles away or a medium size house in the suburbs? 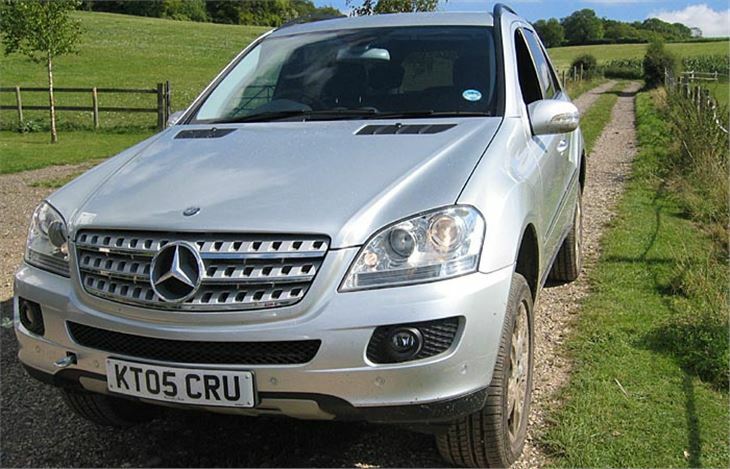 Do you go for a prestige 4x4 that’s good off the road or one that’s good on the road or one that’s half good at both? Until recently those were the choices you faced. LandRovers of all types (apart from Freelanders) were brilliant off the road but dismal on it. BMW X5s and Porsche Cayennes were the opposite. Mercedes MLs, being the first posh ‘lifestyle’ SUVs, were neither. Only VW Touaregs and Range Rover Sports have proved surprisingly good wherever you point them. 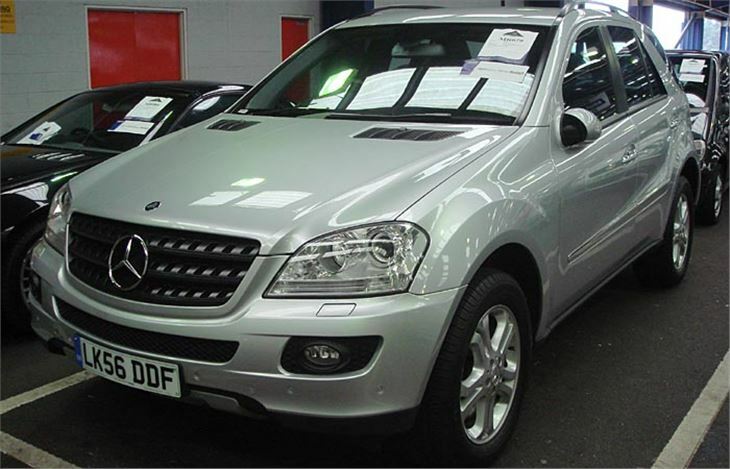 With the new ML, Mercedes has decided that it won’t make the decision for you. 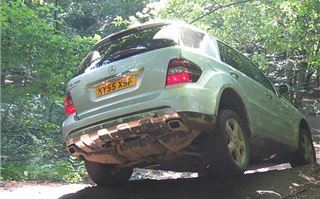 Instead, it sells the car in three different spec levels with three different wheel sizes, makes self-raising air suspension optional, and, for serious off-roaders, offers serious off-road gear as a factory fitted option. The new ML is longer, wider and lower than before. Altogether more impressive without looking aggressive. It’s a monococque instead of a body on a ladder frame chassis, so is much stiffer and not prone to rattles. Basic spec brings you a 7 speed automatic transmission with steering wheel rocker switches for manual gear changing and a column selector for D, R, N and P, Speedtronic cruise control with speed limiter, ABS, offroad ABS, ASR, BAS, Downhill Speed Regulator, ESP and 4-ETS. For improved offroad ability you can specify the addition of Airmatic air suspension that enables you to increase the ground clearance to centimetres. This costs £1,265. Having plumped for that you can go one further with ‘Off Road Pro’ that increases Airmatic gound clearance to a maximum of 30 centimetres and also includes a low range transfer box, centre diff lock and centre and rear diff locks. All new MLs can tow 3,500kg braked trailer weight. 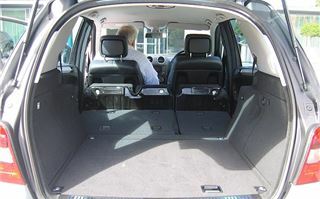 They have a 462 litre luggage area to window height, 801 litres to ceiling height and up to 2,012 litres of loadspace with the rear seats folded. It’s worth mentioning here that the rear seats fold in a particularly satisfying manner. Just tip the 60/40 split squabs and fold the backrests down. They also go back down without trapping the seatbelt latches, which is a nice touch. The range kicks off with the 224bhp 3.0 V6 320 CDI and the 272bhp 3.5 V6 350 (same price), rising to the 306bhp 5.0 V8 500. 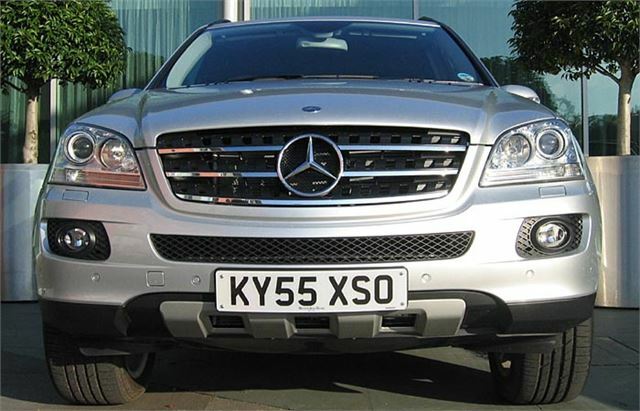 Next April we’ll see a lower priced 190bhp 3.0 V6 280 CDI and next summer the terrifying prospect of a 510bhp ML 63 AMG. We started by driving the cars off-road round a tricky course through woodland, then progressed to on-road afterwards. 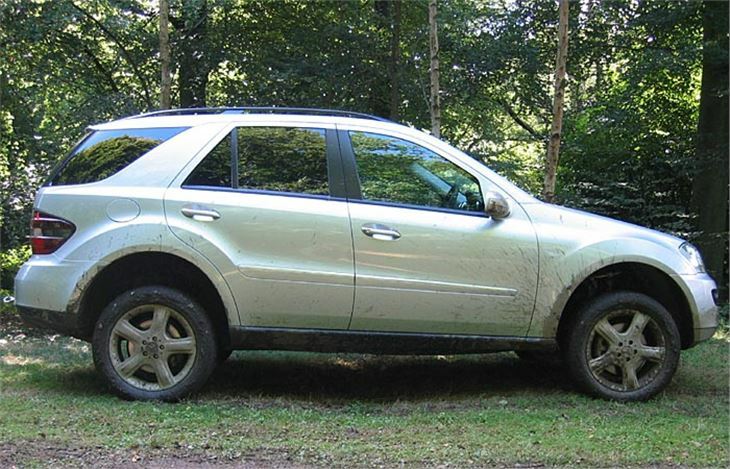 The first car we drove was an ML350 Sport on 19” wheels but fitted with the Off Road Pro pack. 17” wheels with proper off road tyres would have been better for the job, but Mercedes wanted to show how it would manage on high performance road tyres. Making the appropriate decisions is very easy. With the Off Road Pro Pack and low range selected by steering wheel rocker switch you can lock the box in D1 and use the speed limiter to select the maximum speed of your descent from 3mph to 10mph (3mph is recommended for the steep ones). Then, when you get to the bottom, use the column shift to select D and romp up the other side. It was very effective, marred only by the 350 petrol engine’s relative lack of torque at low engine speeds. When cresting an ascent, the comparatively low bonnet gives you a view ahead a vital fraction of a second earlier than with square-fronted 4x4s. We then moved on to an ML320CDI with Airmatic, but without Off Road Pro. This proved even more impressive because of the far greater low speed torque of the engine (maximum from just 1,600rpm). You drive it differently, using the DSR downhill speed regulator rather than engine braking in a low gear and it works very well. Obviously, for ultimate off road ability you would go for the ML320CDI with Airmatic and Off Road Pro on 17” wheels with off road tyres. But, as was proved, very few drivers will ever need that level of off-road ability. And that’s just as well because on the road the ML320CDI Sport shows a strong turn of speed and decent (though not sportscar) handling through the bends. You don’t need to bother with the gearchange rocker switches because, as with the CLS350 I drove earlier this year, the box makes very good decisions for itself. The only downside is very low geared steering. It feels like a big 4x4, not a car, and on ultimate handling I reckon the Cayenne and some versions of the Touareg are more ‘sporty’. Then we tried the car on standard suspension and standard 17” wheels. The ride is a little bit more comfortable on these but the car pitches and squirms and does not give a driver anything like the confidence or the pleasure of the 19” wheels. So, mystery cleared up. That’s why Mercedes put us through the off road course on the 19” wheels. To show us that the best wheels and tyres for on road use could also make a decent fist of it off the road. Any glaring faults? Well, my co-driver was a big bloke and he has some difficulty inserting himself into the driving seat under the immensely strong door frame that slopes sharply back. And with the Airmatic at maximum height, ride not only becomes bone jarring, it’s a long jump down to the ground. 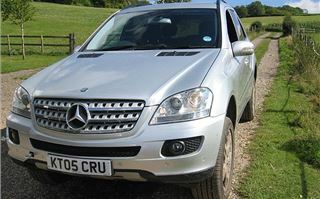 It’s a good vehicle, though, and makes Mercedes competitive against BMW, Porsche and VW. If some sort of fuel economy is important to you, then Mercedes has a better diesel than BMW. 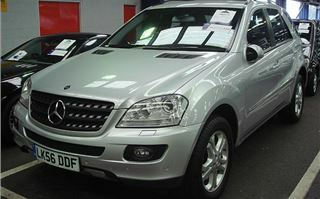 But before you buy an X5, a Cayenne, a Touareg or a new ML you should do your homework and preferably drive all of them.